Yesterday’s Tour of Britain stage in Cumbria provided a thrilling finish in Kendal, Belgium rider Julien Vermote pipped Great Britain’s Steve Cummings to the line. 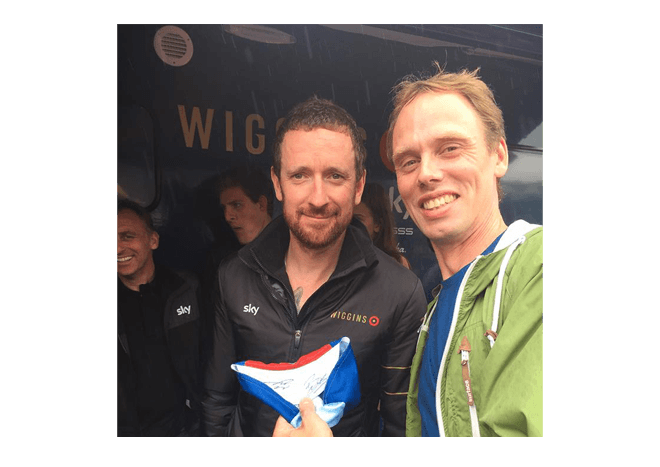 After the event, Sir Bradley Wiggins spent time with his fans in what could be his last road race. Hopefully, seeing the Tour de France winner and the most decorated GB Olympian has inspired the next generation of Kendal cyclists. We’re doing our bit to find and support the next Laura Trott and Bradley Wiggins by helping create, promote and market Kendal Cycle Club. You can find out more about Kendal Cycle Club and see how the club has quickly developed since it started on 1st October 2015. Thanks to James Kirby for the photograph of Sir Bradley Wiggins and Rory with a signed Kendal Cycle Club cap.